The trend of multi-generational family vacations is on the rise. Families are looking to maximize those special moments with children and grandchildren to create life-lasting experiences. With this type of travel comes a concern over expense. It is very attainable, and we can help! Many select the traditional hotel options, as they may be unaware of the idea of renting a villa. By booking at a hotel as a large family, multiple rooms are often required. Square footage is also limited, which means personal space is virtually non-existent. Costs can reach $7,000 for a one week trip. Solution: one spacious villa with multiple bedrooms. Average weekly rate for a three bedroom villa is $4,150*. 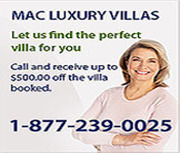 We have villas of various sizes and within various budgets… we can find a fit! Hotel pools are often over-crowded, with no privacy. Personal time with your family can be compromised. Solution: a villa with its own private pool. When vacationing at a hotel, food and beverage costs can often exceed $4,000 for a one week trip. Drinks are also often subject to mark-ups. Solution: villas provide fully operational kitchens... shop for groceries at a local supermarket and create your own culinary masterpieces for a fraction of the cost. Enjoy the best wines from around the world, at amazing savings. *Based on prices as of April 20, 2017. Subject to change without notice.